When your American Girl ® Doll or 18 inch doll has picked out her outfit, she’s going to need doll shoes with which to accessorize. We have doll shoes that range from comfortable lounging to smart casual to formal footwear. 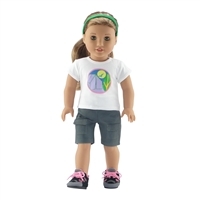 All of our doll shoes are designed and made to fit all 18 inch soft-bodied dolls, including the American Girl ®, Madame Alexander, Gotz, Our Generation, and Journey Girls.